A “winter” day at Polo Beach on Maui in January. For those of us who haven’t lived in a tropical environment, it’s difficult to imagine winters without cold weather. So, we tend to get a lot of questions about what Hawaii is like in the winter. Today, we address some of the most frequently asked questions. How cold is the winter weather in Hawaii? Winter months of January and February are typically Hawaii’s “coolest” months. By “coldest” months we mean average daytime highs ranging from 78ºF to 82ºF. (In Celsius, that’s around 26ºC.) For most people, they would consider those temperatures to be pleasantly warm and could even be described as summery, even though it’s winter in Hawaii. Nighttime lows range from around 63ºF to 67ºF. (In Celsius, that’s around 17ºC to 19ºC.) Though those evening temperatures are lower, they’re still quite warm compared to evening winter temperatures in North America. I can only recall one evening during a January trip to Honolulu that I even needed a light sweater. Note that the temperatures we’ve mentioned are averages. So, there could be temperatures higher and lower, but there usually aren’t huge variations. All sorts of beach, ocean and land adventures can be enjoyed even during Hawaii’s chilliest winter months. Activity-wise, there’s really no difference in visiting Hawaii in the winter versus summer. Note that the perception of cold or warm varies from person to person. What you might perceive as cold, I may feel as warm and vice versa. We have always enjoyed lovely, warm weather during our Hawaii winter vacations. Just in case you are wondering how much temperature variation there is from winter to summer in Hawaii, you may be surprised to learn that there’s not a huge gap. Average daytime highs are in the mid to upper 80s while evening lows average around the mid-70s. For more weather data see our Hawaii weather page. Do I need to pack a heavy coat, long-sleeved shirts and long pants/trousers for a winter trip to Hawaii? Hopefully reviewing the above temperatures will give you a better idea of what sort of clothing you need for a Hawaii vacation in the winter. Think of what you normally wear when temperatures are in the upper 70s and lower 80s in your home town. That’s what would be appropriate for a winter vacation in Hawaii. For us, we wear shorts and short-sleeved shirts for most sightseeing and activities. We don’t pack winter coats or heavy sweaters or any winter wear. We may wear a light jacket or sweater on the plane to and from Hawaii, but we don’t typically use it during our stay. To be prepared in case of a cold snap, bring a light sweater or jacket. Long pants/trousers are not generally needed for keeping warm in Hawaii in the winter. We often bring a pair on long trousers in case we want to enjoy some activities that require them — like horseback riding, ATV riding, zip lining, hiking over lava, etc. More specifically, we recommend bringing moisture-wicking, quick-drying pants for Hawaii vacations. At a minimum, we wear long trousers on the flight to Hawaii, so if there was a cold snap, we could rewear them during our stay. We’ve never needed them due to cold weather in the beach resorts. As you may have noticed, what we wear on the long flights to Hawaii, can be re-worn just in case we’re there during a cold snap. We’ve never experienced a cold snap yet in all our trips, but we’re prepared nonetheless. See our article on what to wear on the flights to and from Hawaii for your comfort. Note that in some of the attractions that are at high elevations, warmer clothing is needed. Examples of those areas are the summit of Haleakala on Maui, Volcano on Hawaii Island, the summits of Mauna Kea and Mauna Loa on Hawaii Island, Lanai City on Lanai, the Pali Lookout on Oahu and Waimea Canyon and Kokee State Parks on Kauai. For more packing advice, see our popular Hawaii packing advice. Do any flowers bloom in the winter in Hawaii? Many tropical flowers bloom in Hawaii all through the year — even in the winter months. 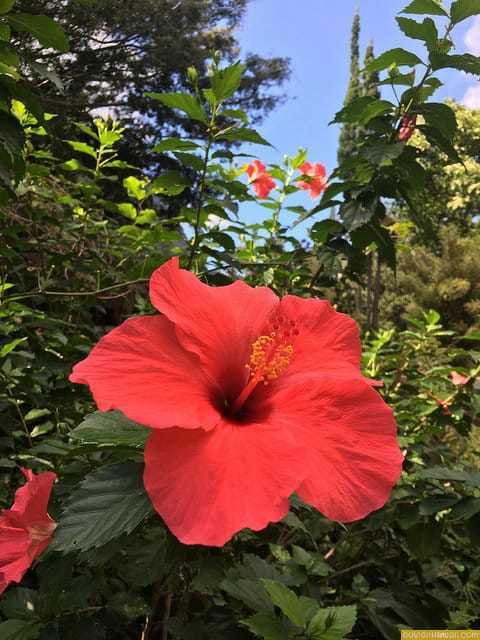 Hibiscus, varieties of plumeria, ginger and many more add to the colorful landscapes of Hawaii. See our post on what flowers bloom in Hawaii. A beautiful red hibiscus blooming in January in Hawaii. Can you swim in the ocean in the winter? You can absolutely swim in the ocean in winter months. We’ve gone snorkeling in December, January, February and March with absolutely no issues with the water temperature. Ocean temperatures in Honolulu don’t fluctuate widely — from a low of 76ºF to a high of 81ºF. Should I be concerned about rain if I visit Hawaii in the winter? Hawaii does average more rain in the winter than the summer. From our experience, we’ve rarely had rain be an issue when we visit Hawaii — no matter what time of year we go. In all our winter trips to Hawaii, I can only think of one day that was mostly rainy. Even then, we still got out and about to enjoy the island. There are some upsides to being in Hawaii during a rainier season. First, the waterfalls should be flowing fully. In contrast to the drier, summer months, waterfalls can be dry or at minimal levels. Also, the islands are more lush and green in the winter. For more information on rain patterns in Hawaii, see our Hawaii weather page and our article specifically about rain. Are there any special reasons to avoid or to come to Hawaii in the winter? I can’t think of a reason to avoid Hawaii. We love visiting in the winter. Winter is when the humpback whales migrate to Hawaii. It’s a spectacular time to see these massive creatures splashing about in the waters surrounding the Hawaiian Islands. 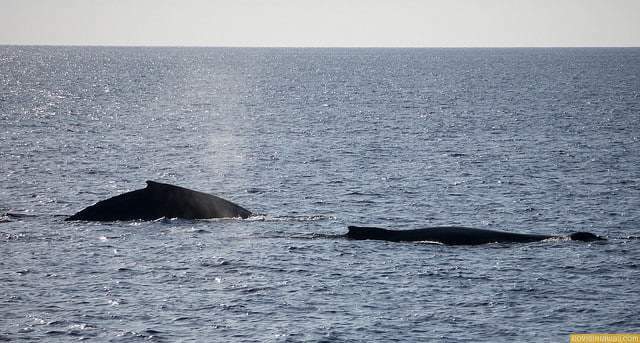 See our post on when and where to see humpbacks in Hawaii. Winter is also when the tall waves hit the north shores. Several professional surfing competitions are held during the winter months. For more thoughts, see our article about Hawaii in the winter. Thousands of humpback whales migrate to the sheltered, warm waters of Hawaii to breed and give birth. So these questions are most frequently asked about Hawaii in the winter. What other winter related questions do you have? The post Frequently asked questions about visiting Hawaii in the winter appeared first on Go Visit Hawaii.